Chime Bank has an innovative twist on conventional banking. Unlike most traditional banks that charge you fees disclosed in fine print contracts and penalize mistakes or misfortune, Chime profits with you as opposed to from you. When you use your Chime Visa card, Chime takes a small cut of the money that Visa charges merchants on each transaction. So, you won’t find the standard penalty fees for overdraft charges, minimum account balance shortfalls, or ongoing monthly fees at Chime. As a mobile-only bank similar to Moven or Simple, Chime doesn’t have a brick-and-mortar network of bank locations, so you can’t walk into a banking location to deposit cash or chat with a customer representative. However, customer support is available by email, phone, and even via chat in-app. A nice feature at Chime is each time you make a purchase, your transaction is rounded up to the nearest dollar and the difference is deposited into your savings account so over time you grow a nest-egg without having to think about it. One drawback you will experience at Chime is low interest rates on savings. Another stumbling block is cash and check deposits. But if you want a mobile banking app on-the-go that won’t nickel and dime you with all sorts of hidden fees, and automates your savings, Chime wins high marks. How Do I Deposit A Check Or Cash? What Is The Savings Rate At Chime? What Are The Fees At Chime? Chime Bank sets aside some loose change from each transaction and deposits it into a savings account, deposits cash back into your account, and processes your paycheck up to two days early. Like any other bank, you can expect to get a checking account – which Chime calls a Spending account – as well as a Savings account. You will also get a Chime Visa card. What you won’t get is a bunch of hidden fees cloaked in fine print. Where Chime shines is all the hidden benefits that lie behind a value-packed mobile banking offering. Each time you pay for something, Chime will automatically round up your transaction to the next dollar, and save the difference. Let’s say you pay on average each day for a few items, such as groceries, gas, coffee, and some other common everyday purchase. If each day you were to round up $0.50 from these four transactions then, by the end of the year, you’d end up squirreling away an extra $730 without hardly noticing it or even lifting a finger. If you want to boost your savings rate, Chime lets you save as much as 10% of your paycheck automatically. On pay day, your money automatically transfers from you Spending account to your Savings account. If you ever fumbled about with complicated points and rewards systems, you will love Chime. Unlike the standard redemption processes that require you to learn what the conversion rate is between points and dollars, Chime automatically deposits cash back into your account on everyday purchases, such as those at retailers as well as at restaurants, on groceries, and even on utilities. When you fund your account with direct deposit, Chime will deposit your paycheck up to two days ahead of the scheduled date because it processes your employer’s check right away. You can link your bank account to Chime and transfer funds easily but cash and check deposits are a bit clunky. Check and cash deposits aren’t Chime’s strongest attribute. While it’s true that you can access over 24,000 ATMs at no extra charge at MoneyPass locations – which can be found in-app – cash and check deposits require a little more fumbling about. Cash deposits can only be done via Green Dot locations, and may incur a fee while check deposits can be done via third-party app. Chime will soon provide a photo check deposit feature that simplifies the process to an in-app snapshot but for now, it’s a little clunky. However, you can easily link your old bank account to Chime and move funds freely to Chime without any hassle. Chime Pay Friends is a feature that lets you divide bills easily among friends. Moving cash between your Spending and Savings accounts at Chime is easy and free. It’s also free to link another bank account and transfer money to your Chime Spending account. A nice money transfer bonus feature at Chime is called Pay Friends, which allows you to divvy up everything from a restaurant meal to a bar tab or even a rent expense among friends. You get to sidestep the regular hassle of counting cash or contributing multiple cards and instead simplify any cost-splitting. Chime puts your savings on auto-pilot but don’t expect to get rich from interest payments. The good and bad of saving at Chime is that while it is easy to save, you won’t earn a ton of interest on your savings. You save when you spend. You save when you get paid. If you struggle to save, Chime might well be the solution that you have been looking for because each time you swipe your card your nest-egg grows a little. 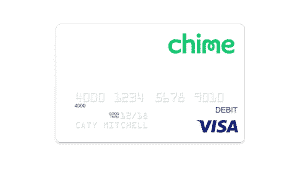 The way it works is every time you pay a bill or purchase something with your Chime Visa card, the transaction price is rounded up to the nearest dollar and the difference is moved to your Chime Savings account. Another easy way to save is when you receive your paycheck. You can transfer 10% of your paycheck into your Chime Savings account automatically so you can reach your financial goals more quickly. So that’s the good. The bad is the annual interest rate at Chime is just 0.01% so you’re not going to get rich from interest earned unless a big Fed rate hike takes place. Chime will transfer cash from savings accounts to cover shortfalls in Spending accounts. Any out-of-network ATMs will incur fee charges of $2.50 per withdrawal. Fee transparency is a highlight of Chime’s mobile banking app and, as you might expect, you won’t be hit with surprise fees the same way you might if your money was parked at a traditional big bank. Monthly, overdraft, and minimum account balance fees are non-existent. There is a catch of sorts to the “no overdraft fees” headline. Chime does not permit overdrafts whatsoever, so your transaction will almost certainly be declined. You may at times run your account into the red inadvertently because an initial transaction is run which keeps your account in the black but when a tip is added at a restaurant during a final settlement your account may go into the red if the original balance was low. If your Spending account runs into the red and stays there for 15 days, Chime will automatically transfer funds from your Savings account to cover the deficit. If your Spending account stays in the red for a full quarter, Chime will notify you that your account will be closed. You will pay a fee of $2.50 if you use an out-of-network ATM but Chime makes it easy to find in-app any of the 24,000 ATMs that won’t cost you a penny. ✅ Automatic Savings: Chime helps you to save easily by automatically saving on each purchase transaction as well as auto-depositing a portion of your paycheck to a Savings account. ❌ Out-of-network ATM Fee: You will pay a $2.50 per transaction ATM fee for any out-of-network withdrawals, but it is free to use any of the 24,000 ATMs in-network that can be found easily in-app. ✅ Low Fees: You won’t pay a dime in overdraft fees, nor any minimum account balance or monthly fees. ❌ Savings Rate: The savings rate is just 0.01% annually so while it is easy to save, you won’t earn much interest on your savings. ✅ Cash Rewards: You don’t have to worry about complicated redemption or points systems with Chime – cash is deposited back into your account automatically. ❌ Cash Deposits: It’s a hassle to deposit cash but easy to transfer cash from another account to Chime so if you want to deposit cash it may be simplest to do so elsewhere and then transfer money over to Chime in-app at no cost. ✅ Early Paycheck: Chime processes your paychecks immediately, so you can get paid up to two days earlier than you might when banking elsewhere with household names. ✅ No Foreign Transaction Fees: When abroad, you won’t get dinged the 1%+ you might at other banks. ✅ Sending Checks: Chime will send checks on your behalf up to $10,000 per month and no more than $5,000 in a single payment. Chime is a mobile-bank that keeps fees to a minimum, makes saving easy, and rewards you with instant cash back rewards. If you struggle to save, Chime Bank helps you to grow your nest-egg. Each time you swipe your Chime Visa card, your transaction is rounded up to the nearest price and the difference is deposited into your Chime savings account. Another bonus at Chime is you can get paid early because Chime processes paychecks immediately, and you can deposit 10% of your earnings automatically into your savings account. Plus, you get cash back rewards so you don’t have to worry about complicated points or redemption systems. A blot on the copybook at Chime is you won’t get rich from the interest earned on savings, and depositing cash and checks is a little clunky. Still, when you combine no monthly, overdraft, or minimum balance fees with early paycheck deposits, auto-saving, and cash back rewards, the pros far outweigh the cons at Chime.